Get first hands-on at PlayStation Experience this weekend. I’m Adam Orth, Creative Strategist at First Contact Entertainment. We are a seasoned VR game development studio located in Santa Monica, CA and I’m very excited to be able to come out of stealth mode and finally reveal Firewall Zero Hour. Firewall Zero Hour is a team-based, tactical multiplayer FPS coming exclusively to PlayStation VR in 2018. Information is power and in the right or wrong hands, can change the course of the world simply with the push of a button. A well-timed release of sensitive data can bring the most powerful swiftly to their knees and crumble empires in an instant. In Firewall Zero Hour, two teams of mercenaries are hired by anonymous contract handlers to either protect or obtain highly sensitive information on a laptop in dangerous and exotic locations around the globe. Each team’s anonymous contract handler acts as their “eye in the sky” and guides each match by providing objectives and critical mission information along the way. Their only concern is the data and they are willing to pay you handsomely for it. As Attackers, your team’s objectives are: Bypass the Firewall access points, Locate the Laptop and Initiate the Hack. As Defenders, your team’s objectives are: Secure the Firewall access points, Protect the Laptop and Prevent the Hack. Each team accomplishes these objectives through highly-coordinated teamwork with an arsenal of modern weapons and offensive/defensive equipment to help their team and hinder the other. Players are rewarded in-game with cryptocurrency and experience points upon the successful completion of contracts/matches and can use those currencies to upgrade contractors, weapons, equipment, load-outs and cosmetic customization. When you pick up a PS VR Aim Controller or DualShock 4 to play Firewall Zero Hour, we want you to immediately notice a heavy emphasis on organized, tactical firefights, team communication, and realistic pacing. That’s not to say that combat won’t be intense and visceral; whether you’re exchanging fire across a hallway or peeking over cover to shoot at a distant hostile, the goal is satisfying, thrilling gunplay. We also want you to feel the tension of defending your position, strategically laying down traps and identifying key vantage points with your teammates. The drama of hacking into a shortcut to your objective or a dark passage illuminated solely by your flashlight is heightened by super-realistic environments and dynamic shadows that bring moments like these to life in truly unique ways. 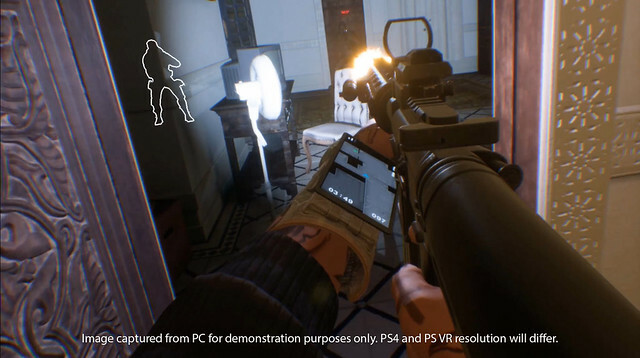 Of course, the most exciting aspect of Firewall Zero Hour is that all of this takes place in VR, allowing you alone, or with your friends through PlayStation Plus (required for multiplayer), to be transported and immersed into the action in a way that’s never been possible before until now, through the magic and presence of VR. We are so excited for you to experience Firewall Zero Hour; there’s a lot more to come. If you’re at PlayStation Experience this weekend, we’re thrilled to confirm that we will have a fully playable 4v4 PvP demo on the show floor throughout the event. Keep in touch and let us know what you think. This is going to be awesome, I just know it. Can’t attend PSX this year so I sadly can’t check it out this weekend! Please let me Beta Test the game!!! This is what i was waiting for all the time!!! Great Job! If you need experienced Alpha and Beta testers, please let me know! Will there be C4? That’s all I need to know. I always had this idea where … you could place multiple pieces of C4 (up to 3) and detonate them separately (but quickly). That map/screen on the arm would help with that a LOT, because it would help you choose which to detonate, if enemy locations are visible on in. Free ideas for you over here! Looks awesome, I can’t wait!! Hey I was wondering if there was any way to sign up for beta. HUGE follower of the R6 series and CS, recently added a ps vr to my collection. Hit me up with a beta invite pretty please. This is the ****. Can’t wait for this game! Please don’t forget us left-handers!!! Also, smooth turning and no blinders. Some people can handle just about anything VR can throw at us. I rebought a PS4 Pro and PSVR for this game alone.